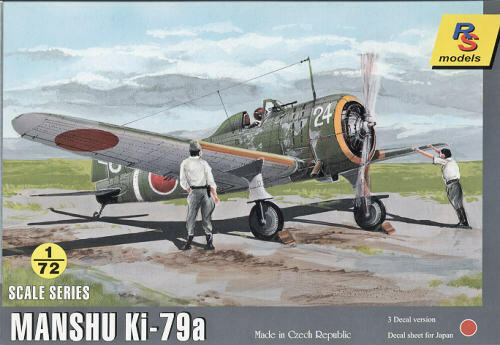 Manshu was manufacturing the Ki-27 under license in Manchuria. In 1942, they undertook a redesign of the aircraft as an advanced trainer. Both a single seat and twin seat trainer were produced, using the lower powered Hitachi Ha-13 and Ha-23 engines. By 1943 there were enough to equip several training schools as well as the Tokyo Air Academy, which mainly received the two seat version. This and other schools were set up to interest high school boys into becoming pilots and basic training in aviation was provided. Others were used to train volunteers for kamikaze missions later in the war. Training schools were also established on the type in Korea, Singapore and other Japanese occupied territory. In Java and other Indonesian islands, local Indonesian forces took over these and other Japanese aircraft after the war, offering Japanese pilots the opportunity to train local pilots for the insurgency against the Dutch. Those left in areas overrun by the Soviets or Chinese were used by their respective air forces. 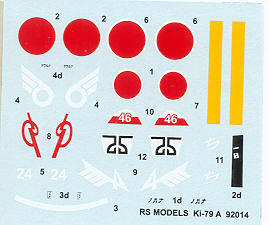 Most of the parts in this kit are identical to the Ki-27b that was reviewed a bit earlier. The etched fret, main sprue with the wings and the acetate instrument sheet are exactly the same. Where this one differs is in the fuselage sprue. That contains such bits as the new fuselage, interior floor, bombs, prop, head rests, exhaust, tail wheels and a few other bits. 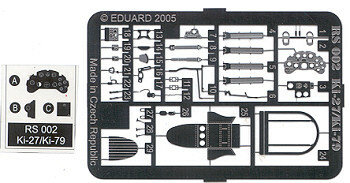 Even on this sprue, not all the parts will be used as several of them (like the bombs) are blanked off in the instruction sheet. Molding is excellent as it was on the other kit. Finely engraved detail and a distinct lack of flash and ejector pin glitches. Some of the thicker parts (such as the head rest) have areas that are sunken in, but repair should be a snap. I have found that the trailing edges of the wings are rather thick and so will benefit from some sanding down prior to assembly. The kit provides the proper open landing gear with the larger wheels that were normal on the Ki-79 as well as the different engine that this type used. The photo etched fret is well done and includes most of the interior as well as some additional smaller bits. Frankly, some of these pieces (like the pitot tube and control stick) would be better done as injected plastic as they'd then not be so two dimensional. My kit was missing the windscreen and I've e-mailed RS Models to see if they will supply a replacement. I'm not sure if this is injected plastic or vacuformed. 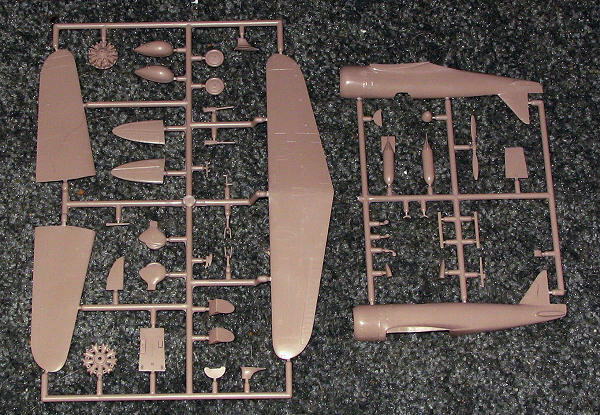 The one on the Ki-27 was vacuformed. Instructions are well done and provide color information in generic, Humbrol and Agma colors. Some smaller bits will have to be added from plastic rod/tubing, such as those odd fuel dump(?) tubes under the left wing. Markings are for at least four aircraft, all in olive green over light grey. They all sport nice tail art as was the norm for Japanese Army planes. Most of these were based in Manchuria or Singapore where there was little fighting and so training could go on without constant interruption from air raids. The planes are from the Kyoiku Hikotai in 1944/45. Decals are nicely printed and look to be quite thin. The white surround to the Hinomarus is off register so you'll need to find replacements in the spare bin. Another very nice model from RS and one that has not been kitted as an injected plastic kit in this scale before. My thanks to www.hobbyshop.cz for the review sample. You can find this and hundreds of other kits and accessories from the hyperlink.